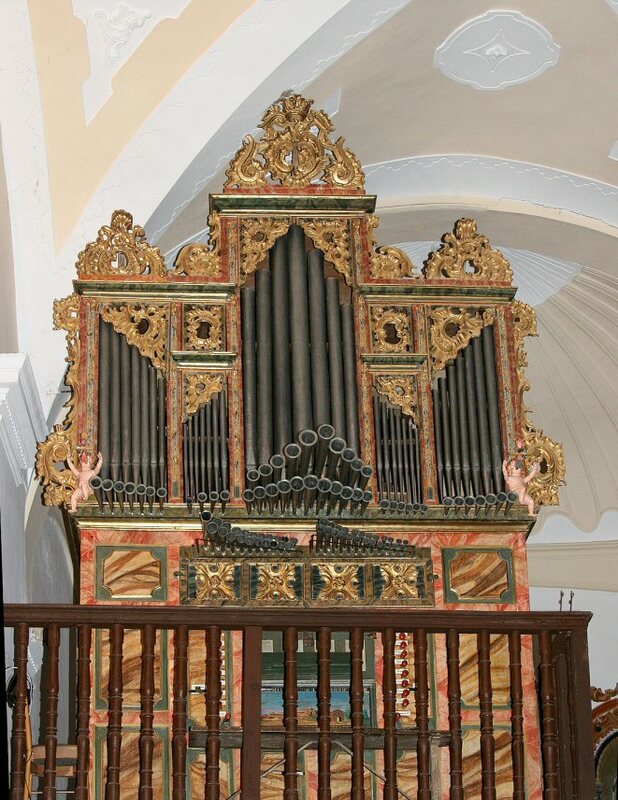 Description: This was probably the first instrument built by local organ-builder Tadeo Ortega, and dates from 1776, when he was twenty-seven. Little is known about the history of the instrument, but it was cleaned and repaired at various times between the mid-nineteenth century and the early twentieth. By the middle of the twentieth century, it had become a ruin, with some pipes missing and many severely damaged. In the late1980’s some registers were made playable, and then in 1997 the organ was totally dismantled and taken to the workshop of Alain Faye in the south of France. He carried out a full restoration, using as much of the original material as possible. The organ retains its original soundboards and much of the mechanism. The majority of the pipes were recoverable, but most of the mixtures are new, as is the 8’ internal Trompeta Real. Enough original material did remain, fortunately, for these new pipes to be an accurate re-creation of the originals. The wind is now supplied by an electric blower feeding a parallel reservoir which, to judge from the newspapers glued to it, dates from 1911. This was probably the time at which the instrument had last received attention before recently being brought back to life.